Real Name: Turles(pronounced Tur-Les), Son of Bardock. Resources: Pr(4)/Rm(30) when working for the Shi'ar Empire(30). Age: 40 Height: 6' Weight: 230LBS. Talents: Martial Arts B & E(Saiyan Shotokan), Military, Pilot(space), Leadership. Contacts: Planet Vegeta Prime (Homeworld, destroyed), Shi'ar Empire (All known-Saiyans serve the empire. ), Goku/Kakarott(brother), Gohan(nephew), Raditz(brother, deceased), Bardock(father, deceased), Celipa (mother, deceased), Toma & Panboukin (uncles, deceased), Turles' Crew (Crew, deceased). Growth - Atomic Gain: permanent, 20' tall, weight of 4 tons, is +1CS to hit, Un(100) Strength, Mn(75) Endurance, Health is changed in proportion. Kinetic Bolt: By making a Yellow Power FEAT, Turles can convert ambient plasma, radiation, thermal, light, magnetic, and electrical energies into a single blast of force that does In(40) force damage. By making a Green FEAT, Turles can fire a Rm(30) force blast. Light Control: By making a Yellow Psyche and Reason FEAT, Turles can convert his plasma energies to radiate ambient light in the form of a glowing energy sphere. The light emitting from the sphere is of the same frequency of moonlight generated from a full moon. He can use this to trigger transformations in himself or other Saiyans (with tails) to Uzaru form. Plasma Generation - Fire, Heat, Electricity: By making a Red Psyche FEAT and Yellow Power FEAT, Turles can focus his internal energies into a ring of energy that does 20 points of fire, 20 points of heat, and 20 points of electrical damage. He can then fire the ring to either entrap a target or encircle multiple targets. This is his "Ring of Fire" technique. By making another Red Psyche FEAT while maintaining the ring around a target, Turles can cause the ring to explode to do 40 points of force damage to the target and anything else withing 10' of the ring. True Flight: In(40). By making a yellow power FEAT, Turles can combine his hyperspeed with his flight to travel for 1-5 turns at Am(60) air speed. Resistance to Aging & Disease: Rm(30). Weakness: See Saiyans. Due to his training as a military tactitian and his leadership skills, Turles is +2CS to resist his genetic instincts. Note: After eating a fruit from the Tree of Might, Turles' physical stats, Body Resistance, Hyperspeed, Hyper-Leaping, and Plasma Control powers increase by +1CS. These were then lowered back to their prior levels when Goku drained the energies of the tree and its fruit to form the "spirit bomb" that destroyed the tree and killed Turles. Turles is the eldest son of the Saiyan squad leader named Bardock. Because of an above average power level at birth, Turles was raised and trained on Planet Vegeta Prime to be a squad leader. At the age of 16 he and his squad were sent on their first mission offworld. Fortunately, for the young leader, he was in another part of the Shi'ar galaxy when Galactus consumed the Saiyan homeworld. For over 20 years, Turles and his crew served in the ranks of the Shi'ar's shocktroops. During a mission to put down a rebellion on a planet in the outer rim of the Shi'ar galaxy, Turles and his crew came upon the ruins of a temple dedicated to the cosmic entity known as Porunga. Turles, never hesitating to use new technologies, used his scouter to scan the heiroglyphs on the temple walls. The scan revealed the hiding place of a seed of the legendary Tree of Might. The heiroglyphs also told of the power that could be gained by eating the fruit of the tree. Seeing this as an opportunity to become stronger, Turles and his crew soon retrieved the seed from its hiding place. 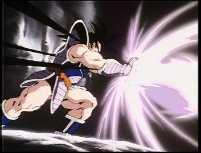 Upon returning to his ship, Turles' scouter picked up a massive power surge keyed to the power frequency of a Saiyan. After triangulating the position of the signal, Turles found that it was coming from the Earth. The Saiyan squad leader crossreferenced all known Saiyan flight paths in that sector of space. He found that the last Saiyan flight path was that of the capsule containing his youngest brother over 20 years ago! Turles gave the order to go to Earth. Turlis and his crew soon landed on Earth to investigate the possibility of Saiyans on the planet as well as to plant the seed of the Tree of Might. The Z-Team rushed to investigate the appearance of the planet-draining tree. They were soon in battle with Turlis' crew. During the battle Turles' scouter notifies him that child known as Gohan was the source of the Saiyan energy surge. The Saiyan squad leader captures Gohan and reveals that he is his uncle. Turles offers his brother Kakarott the chance to return to join the rest of the Saiyan race or die on the doomed Earth. When Goku refuses, Turles creates a globe of artificial moonlight to awaken the hidden power inside Gohan. The young half-Saiyan transformed into an Uzaru for the first time. Goku's worst fears had come to pass. His son had inherited his genetic "curse". Gohan's primal rage overwhelmed Goku. Fortunately, for everyone, Gohan's pet dragon---Ikarus---calmed him down. Frustrated at having his plans thwarted, Turlis decided to destroy Gohan. Goku interfeered and caused his brother's energy blast to damage Gohan's tail. This caused Gohan to revert to his humanoid form. An angered Goku pummels Turles. Surprised by the sudden power surge in his little brother's attacks, Turles decides to speed towards the fruit chamber of the tree. Just as Goku enters after his brother, Turles eats a fruit. The fruit's benefits soon become apparent as Turles beats Goku to a pulp. Gloating, Turles begins to eat more of the fruit. 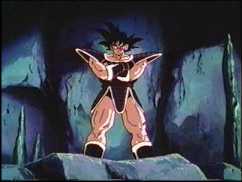 Unbenownst to the Saiyan mercenary, Goku had drained the energies of the tree to form a "spirit bomb". He then hurled the "bomb" at Turles. Thinking this a feeble attack by a beaten foe, Turles attempted to block the attack. He realized, to his horror, that the energy contained in the "bomb" was beyond his power. The last thought through his mind as the "bomb" exploded was that he hated his father for siring a weakling that somehow had the power to destroy the eldest and most powerful son.